Jagannath University A Unit Admission Result & Seat Plan 2018. Jagannath University A Unit Seat Plan 2018 is publishes. Jagannath University Admission test ‘KA’ Unit Seat Plan & Admission Result 2018 will found in Jagannath University notice board, website at www.jnu.ac.bd, www.result.jnu.ac.bd & our website at AllResultBD.com. Jagannath University ‘A’ Unit Seat Plan & Admission Result 2018. 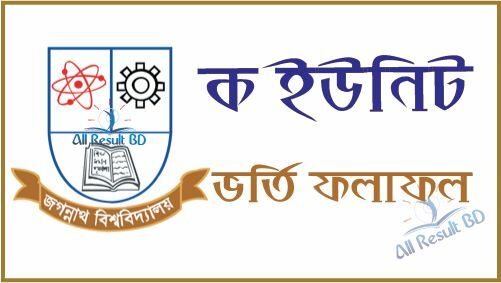 Jagannath University Unit ‘KA’ Admission Test for the academic year 2018-2019 of Graduation (Honours) 1st year will be held on 29th September (Saturday) 2018 at 10.00am to 11.30am & 03:00 pm to 04:30 pm. Already admission test seat plan is announcing. Total 57 Thousands & 703 Hundreds candidates were applying for Jagannath University Unit ‘A’ Admission Test 2016. But only 760 (for Science background students – 725 & other students – 35) seats are available for Jagannath University Unit ‘A’. That means 76 candidates will fight against 1 seat. This admission test will organize entire 29 centers in Dhaka city. JNU Unit 1 Result Download There is no enough time to start Honours 1st year admission test. Jagannath University is one of best university in Bangladesh. So, many students try to study there. But, all students can not apply for limited seats. Unfortunately, many good students with CGPA 5.00 result could not get study here. All applicable students cannot get option for some points at admission test. There are a lot of students apply for Jagannath University (JNU) Admission Test 2017. This year also happened same like before. Candidates will not carry calculator, watch, mobile & any electronic devices in exam hall. Candidates have to wear half sleeve dress & slippers on the day of exam. JNU A Unit 2nd Shift Seat Plan Donwload If you read Physics, chemistry, mathematics, biology in HSC as forth subjects then you have to make answer in the Jagannath University A Unit Admission test. There is no chance to answer Bangla or English Subject Instead the fourth subject.